One of the most notable differences between home-cooked meals and those served in restaurants can be found in the flavor of the sauces. While some cooks are comfortable adding a little of this and a splash of that, recreating a sauce sampled on the town is a challenge for many. For those who need a little boost of kitchen confidence, here are a few tricks from behind the hot line to stir up some culinary creativity. I am married to an all about the sauce guy so sauces are greatly appreciated around here and I decided that it was time to master at least one reliable recipe. I dove into a wonderful sauce recipe and ultimately could not stop myself from taste testing…to learn a few great basics is my goal this year and today I started with a “brown sauce” and what better teacher than Julia Child and Mastering the art of French Cooking, one taste and I was lost in sauce heaven after all of the typically half fast “pan” sauces, good in their own right, but lacking the big boost of flavor that I expect from a “sauce”. I call it a lost art and once one tastes a really good rendition of a good basic sauce, restaurateurs beware as the gloppy messes you serve as sauces and gravies will be forever banished if I can teach one person “a sauce” recipe! 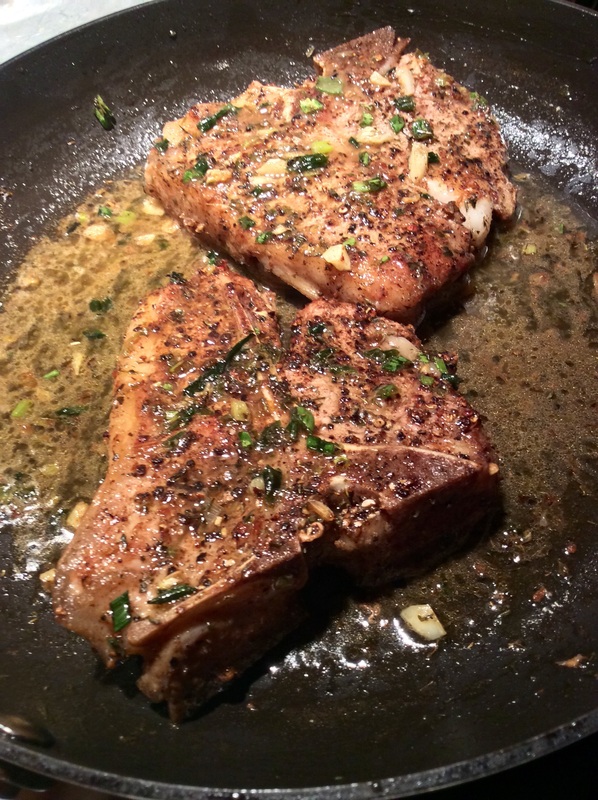 This night was a night for veal chops and I didn’t feel like grilling them in or out and I quite frankly need to get chops in a pan skills up to par…Calling Julia into the kitchen as always when I’m bored and progressing from there I successfully pan seared my veal chops according to “Veal Chops with Herbs”. I did spend the greater part of time on a brown sauce, a peppery version of brown sauce. Well worth the effort and I will certainly try the other versions now that I have this one down. I froze enough for a later date, but tonight some of the peppery sauce for the chops. Cook the vegetables and ham or bacon slowly in the butter, fat, or oil for 10 minutes. Blend the flour into the vegetables and stir continually over moderately low heat for 8 to 10 minutes, until the flour slowly turns a golden, nut-brown. Remove from heat. With a whisk, immediately blend in all the boiling liquid at once. Beat in the tomato paste. Add the herb bouquet. 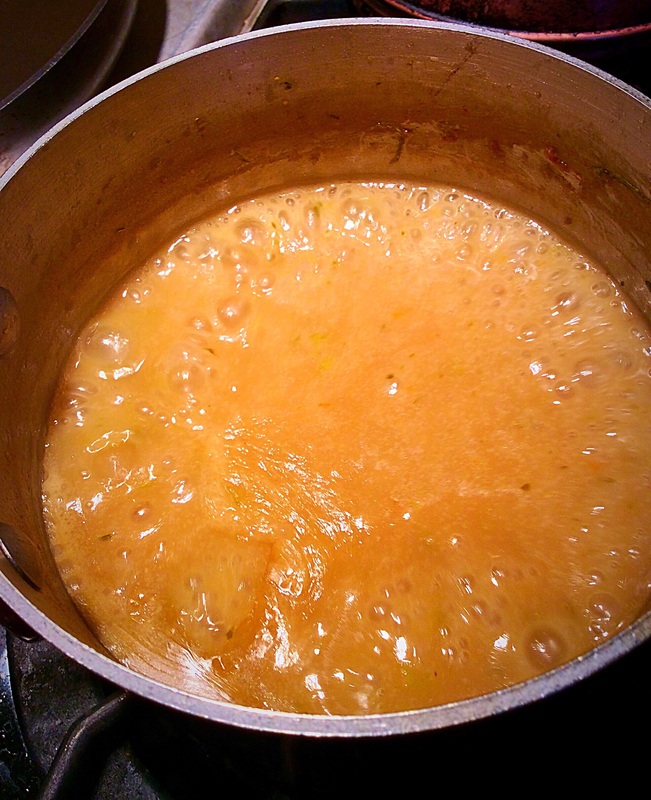 Simmer slowly, partially covered, for 2 hours or more, skimming off fat and scum as necessary. Add more liquid if sauce thickens too much. You should end up with about 4 cups of sauce. The sauce should be thick enough to coat a spoon lightly. Taste and strain, pressing juice out of vegetables. Pour into fat separator cup, voilà a delicious sauce. If not used immediately, clean off sides of pan, and float a film of stock over the top of the sauce to prevent a skin from forming. When cold, cover and refrigerate or freeze. Posted on February 7, 2015 by ibbeachnanaPosted in Basics, MeatTagged brown sauce.